Considered demons of the underworld or of the sea, the Gorgons, whose name means ‘savage/ horrible,’ were the daughters of Phorcys and Ceto. They had feminine bodies covered with scales and hair of vipers, and whoever that looked at them would be instantly turned to stone. 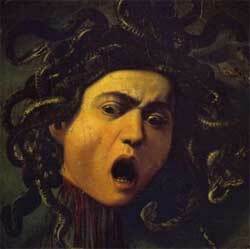 The Gorgons consisted of Medusa (“ruler”), the most infamous of the three and the only mortal one. Her sisters, who were both immortal, were named Sthenno (“forceful”) and Euryale (“far-roaming”). According to legend, Polydectes told Perseus that he would rather have the head of a Gorgon more than anything in the world. When he announced he was getting married, Perseus declared he would bring back one of their heads as a present. Hermes met Perseus during his journey and gave him a sword that wouldn’t be bent or broken by Medusa’s scales. Pallas Athena also aided Perseus by giving him her shield of polished bronze and told him to use the shield as a mirror so he could see Medusa. 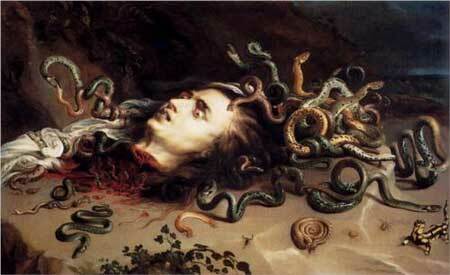 Perseus found the Gorgons asleep, and after Hermes and Athena had told him which one was Medusa, he cut off her head.